Belgium was the final stop on our European summer vacation. We had planned 3 days in Belgium using Brussels as a home base. Our first day was meant to be spent in Brussels, just exploring Belgium’s capital city. 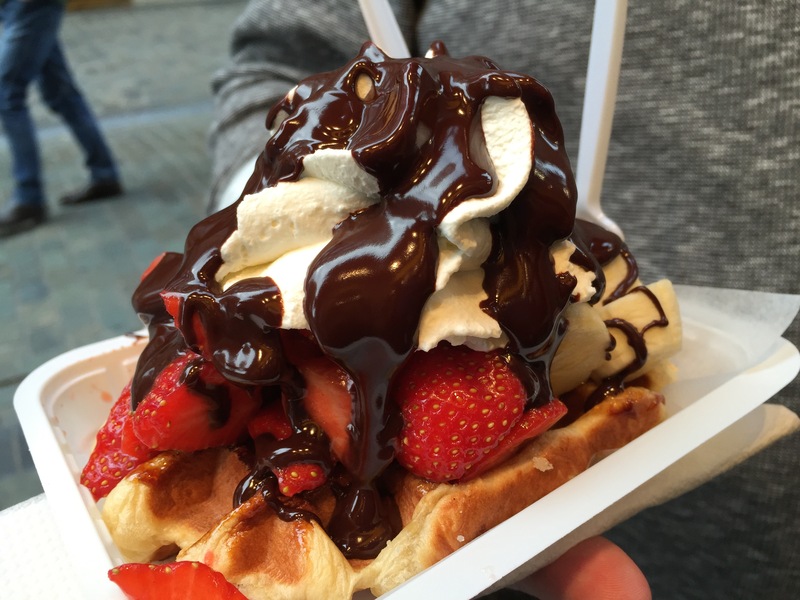 When you think of Belgium, a few things come to mind: mussels, chocolate, beer and waffles. As we were walking through the center of Brussels, around the Grand Place area, we would literally walk through blocks that had nothing but beer stores, waffle shops and chocolate shops. The smells that came out of the waffle shops were unbelievable, and all the people standing outside these waffle shops all huddled over their own waffles just looked way too good to pass up. 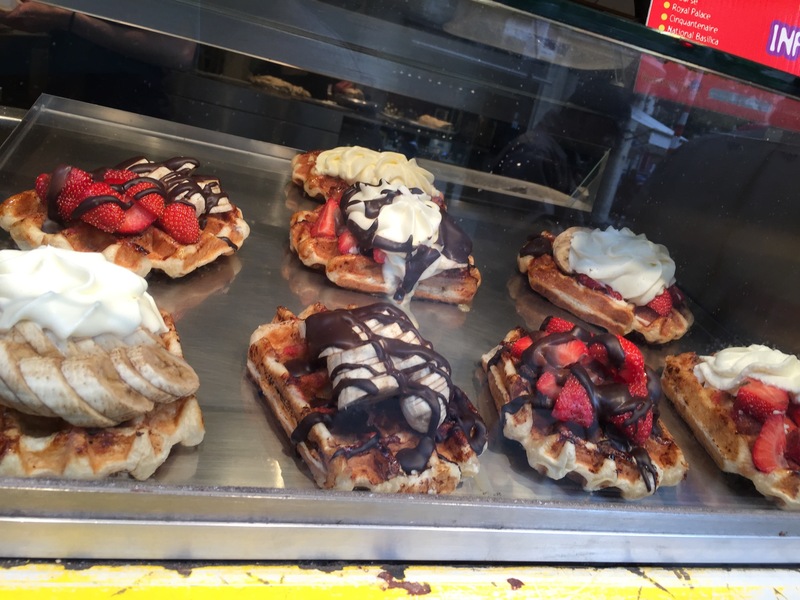 We decided to make a stop ourselves to try one of these amazing waffles at a little storefront just off the Grand Place called The Waffle Factory. It was literally being operated by a mom and daughter who were making the batter and cooking the waffles just inside the store. The store is literally the size of a shoe box. There’s a storefront with a glass display case so that you can see all of the different waffles, then behind the display case are some waffle irons and some counter space where the batter is made and the waffles are created. It’s definitely no fuss, no frills, just straight up waffles. It was only later that I learned that while most Americans refer to waffles that come from Belgium as Belgian waffles, that is actually not the correct term. 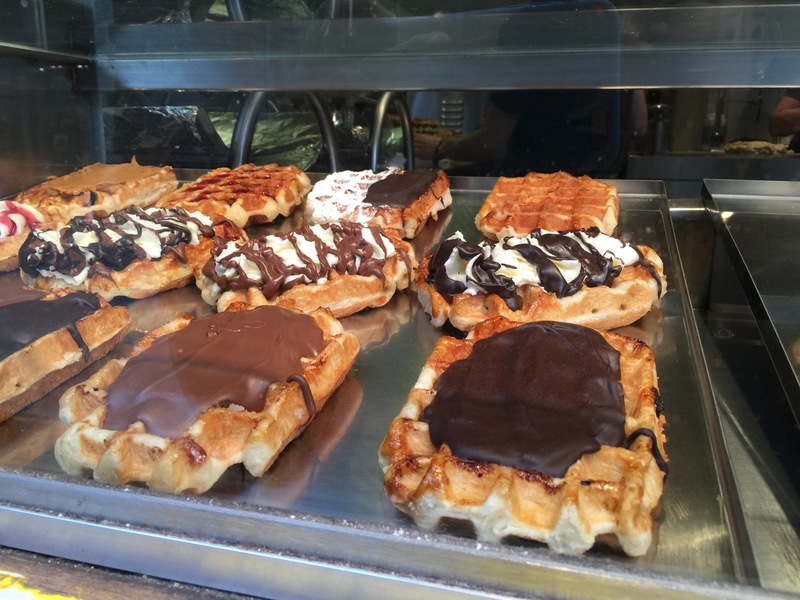 In Belgium, there are 2 kinds of waffles: Brussels waffles and Liege waffles. 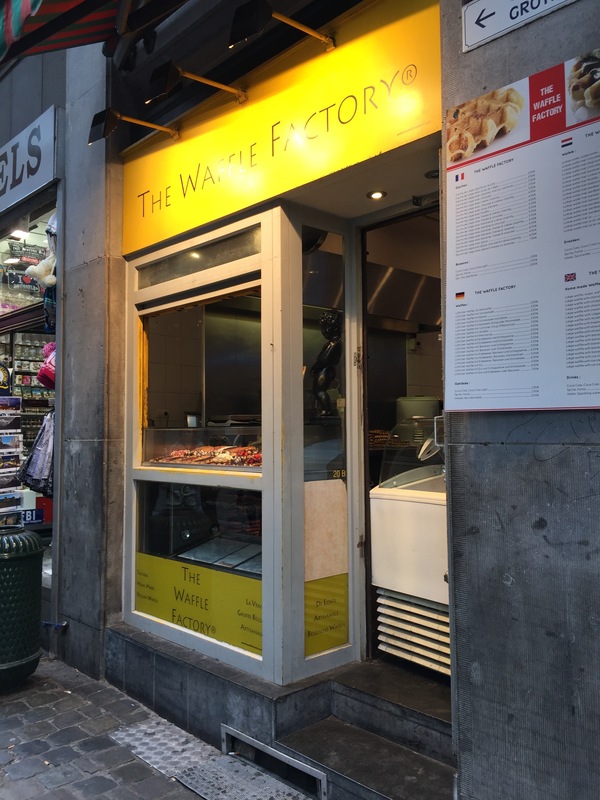 And even though we’re in Brussels, what’s being served here at The Waffle Factory, and many of the other waffle shops you find in Brussels are actually Liege waffles. Confused yet? The waffles that we know in the States that are soft and fluffy and served often at breakfast and brunch are actually Brussels waffles. Brussels waffles are lighter and airier with large rectangular sides and deep pockets. The batter for a Brussels waffle is general egg-white-leavened or yeast-leavened. With a Liege waffle, the batter is often thicker and denser, almost like bread like and sticky. It’s definitely not a liquid batter that gets poured into the waffle maker. Essentially, you end up with balls of dough, almost like you’re making bread, and you drop the ball of dough into the waffle maker, and when the two iron sides of the waffle maker come together, they press the dough out from the center and you end up with a waffle that may be odd shaped and not completely square or round depending on how much dough was dropped into the waffle maker. The Liege waffle is also richer and sweeter made with chunks of pearl sugar which caramelize on the outside of the waffle when they are baked. Therefore, when you bite into the Liege waffle, you immediately can tell how thick and sticky it is as well as tasting little chunks of sugar mixed into the batter. Looking at the display case of all the different types of Liege waffles we could order, my husband and I agreed to share a waffle, for which he let me choose whatever toppings I wanted. The topping options included items such as whipped cream, nutella, chocolate sauce, strawberries, bananas, powdered sugar and caramel. 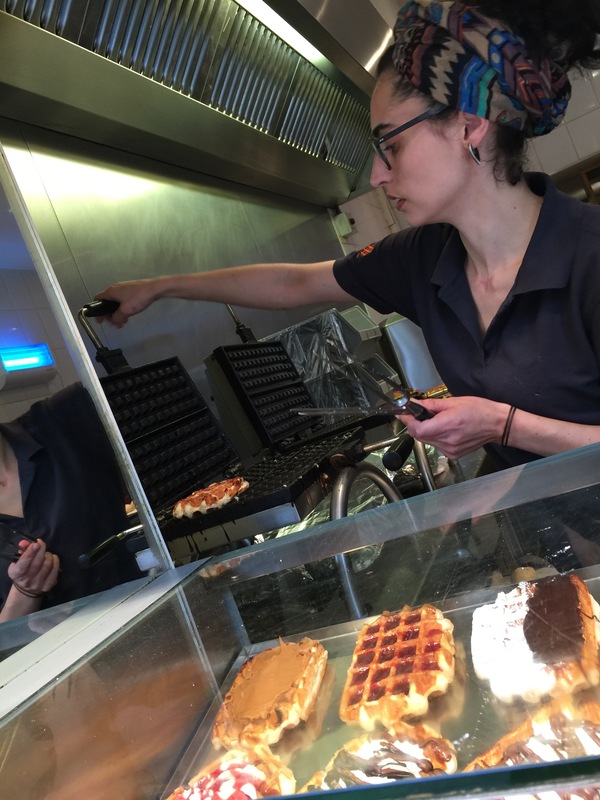 The store’s display case carried a varied mix of different types of waffles with different types of toppings so you could see what combinations you could order. All of them looked delectable. Sugary waffles, chocolate sauce and whipped cream, how could you go wrong? After placing my order at the window, a previously made waffle was pulled out and re-heated on the waffle iron to get it crispy and warm again. Meanwhile, the proprietor went and gathered the toppings that I had ordered for my waffle, including cutting up some fresh bananas and getting out the strawberries. After the waffle was warmed up, she put all of the requested toppings atop my waffle and finished assembling the concoction.